Hello and welcome, if you are reading one of my blogs for the first time, I am Martina Paul, I provide various wedding planning services in the Cotswolds and beyond. My focus is absolutely on keeping the wedding planning a stress-free journey, which allows my couples to be creative and have fun. 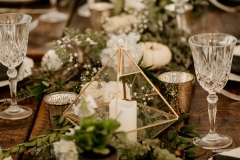 In this blog, I would like to focus on the wedding trends I observe in 2019 not just in the UK, but around the world. And I believe these are here to stay for 2020 too. The weddings are strongly influenced by the bride & grooms taste and new ways they communicate their love story to their guests. 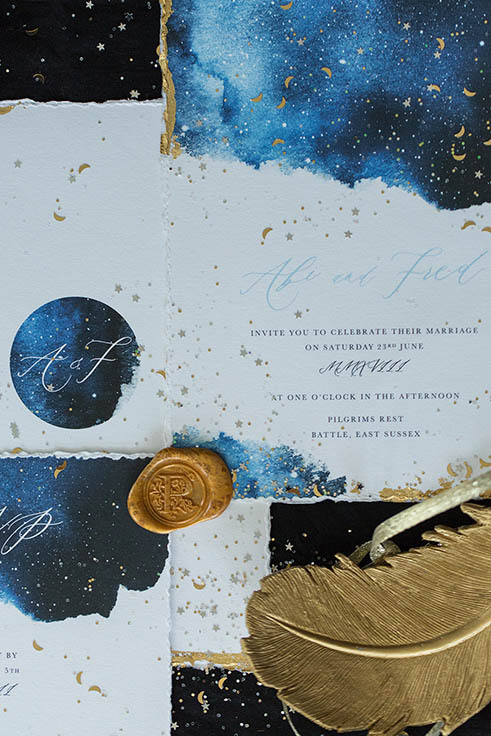 They create their own logos which can be seen already from the invites and RSVPs. The logo can then be transferred onto the rest of the stationery. It can also be a light projection onto the wall, the DJ projecting it onto the dancefloor, or coasters going under the cocktails. The couple’s taste can also be seen in various linen, textures of the wedding décor, and personalised music. There are so many ways to make a personal statement. And It will look fantastic on the day! Hotels are bringing opulence and luxury back to weddings. With a big ballroom wedding also comes crisp white linen, Cristal glassware and a very smart looking team that looks after the couple from the moment they walk into the hotel throughout their stay. Chairs, tables and chill out areas are getting hired and moved in. Furniture is being swapped instead of the existing ones at the wedding venue. 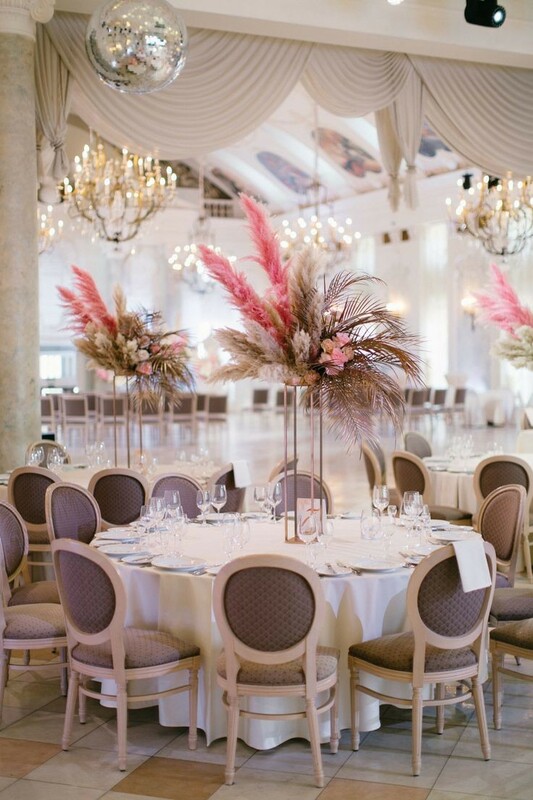 Even Chiavari chairs are getting replaced by French cross back chairs, Ghost chairs or a traditional restaurant chair. We also mix round tables with long trestle tables which makes the seating arrangements more fun for the guests. Weddings are becoming more complex and multi-day events. And it means that the family and friends are looked after at various events. Should it be a pre-wedding dinner at their hotel, a Sunday morning brunch or a spot of sightseeing in the days leading up to the wedding? All of this can be organised for the couple and their guests under one roof with us! Apart from the wedding day, we can also help with a proposal, finding and booking the perfect honeymoon, or organising any other event. There is a big beautiful ceremony, a reception dress and an evening party dress. Second dresses make perfect sense if you want to really dance your night away but still look dreamy on the wedding day. The day time Bridal wedding gown is usually spectacular and the skirt bigger than the evening dress. We can also see an evening jump-suit or jump-shorts depending on the weather. Styling the wedding has become bigger and more important than ever. We are no longer looking at some bits and bobs within the wedding that are special. Complete look and feel of the ceremony and reception room matters and must take guests breath away. This is one of the reasons wedding professionals plan at least one photo shoot a year to inspire the couples and showcase their taste and upcoming trends. We can see anything from the cherry blossom trees around the room or being a table centrepiece, to detailed graphics and couples’ initials in various details that elevate even a plain white napkin. Budget, Venue choice, and Style are the first three major parts of the wedding planning and will dictate all other details. 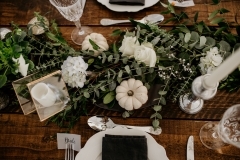 Styling and wedding design are then planned well in advance. 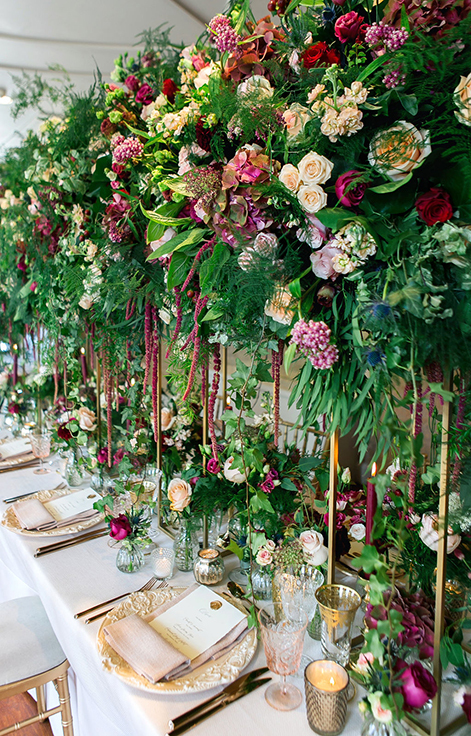 Colours of the wedding are chosen either by following the trend or a personal taste. We have seen a lot of greens and whites following the Royal Wedding last year and it is very much staying as it is such a fresh and classy look. Coral has been announced as a colour of the year 2019 as it is a very warm and summery palette. The world is getting smaller and couples from various backgrounds meet and fall in love. It is such great fun planning weddings with different traditions, colours, tastes and music. Modern couples are making their very own statements and bring their own culture into the 21st century while still respecting their heritage. I can speak from experience as I had a traditional Czech wedding with a beautiful lake backdrop, with a Mediterranean fish main course, West Indian music, and officiated by my British Celebrant friend. And, of course, enjoyed shots of South Moravian Slivovic afterwards. As someone has mentioned, the budget simply is “The list of priorities with the numbers attached to it”. And it means no matter how big or small the budget, every couple will always allocate more money to the aspects of the wedding that matters the most to them. And as a wedding planner, I make sure they spend their money smart, don’t overpay, and get a discount if provided by the recommended supplier. This year and hopefully going forward we can see investments into good quality stationery, linen, silk or chiffon table runners, classy glassware, and crockery. Fully set up tables then look like they are from a wedding magazine. Most couples regret not investing in the parts of the wedding that will last the lifetime and remind them of the day on a daily basis. This will be rings, photography, and videography. The most couples are not quite sure about hiring a videographer as it seems like an extra cost. However, the video captures the atmosphere of the day in a way that photography can’t, it captures the loved ones in action, the speeches to be remembered, and most importantly the wedding ceremony. Take your time. Enjoy the engagement before you jump into planning your wedding. Choose your wedding planner wisely. Make sure you meet them, trust them and like them. There needs to be an understanding of where you are coming from and what your vision is. And remember, a wedding planner is a professional within the wedding industry, you don’t need to micromanage. Let them look after you and allow yourself to be surprised when walking into that stunning ceremony and reception room.